Whereas once the story for brassware was simple – contemporary and chrome – now it is much more complex. Personalisation of the bathroom space is key, as consumers seek to make their bathroom, including their showering space, individual to their needs and interior design aspirations. And consumers are prepared to pay more for the showering space to meet their exact demands, as senior category manager of Grohe UK Paul Bailey adds: “We have seen a growing rise in consumers spending more on their shower system when upgrading or allocating a bigger portion of their budget on their shower when renovating. “Consumers are seeking better performance and more hi-tech features from their shower and therefore are willing to pay more.” So what should bathroom designers be showing to their clients, to maximise profit on their shower sales? Without doubt, the showering space continues to be driven by the trend for wellness and self-care, with boutique hotels and spas driving a more open-plan bathroom space. The shower has become the design focus of the walk-in showering spaces, with large expanses of glass proving little detailing and therefore placing greater emphasis on the shower itself. 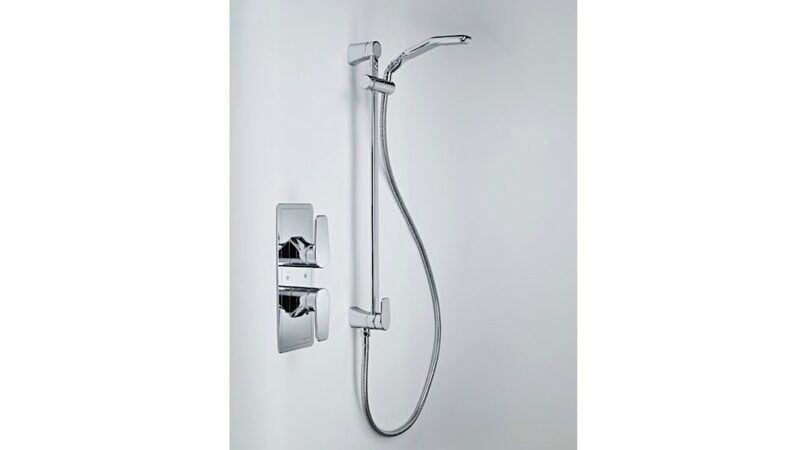 So, in terms of the shower, bigger continues to be better, as Paul Bailey of Grohe says: “Drench head-style showers are still a popular choice due to the volume and force of water they provide. “A square design head shower is becoming more popular and can add an on-trend look to the room. 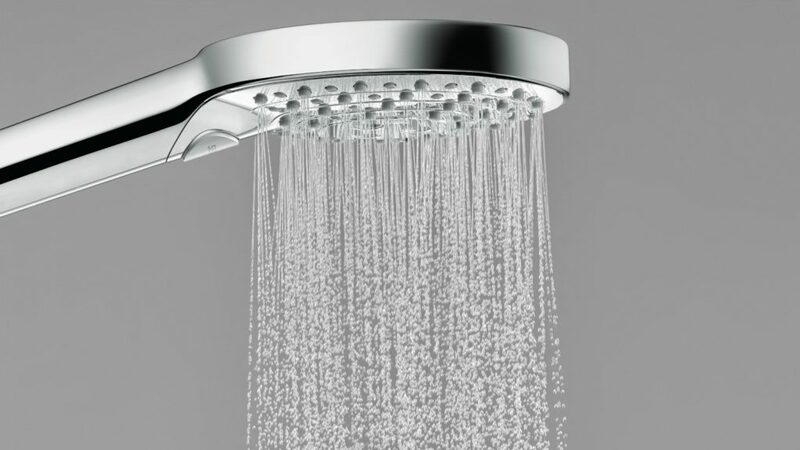 Vado recently introduced its Geometry showers in both round and square head varieties. However, personalisation is also key in the spray options, which is reflected in multi-mode shower heads and even dual head options. 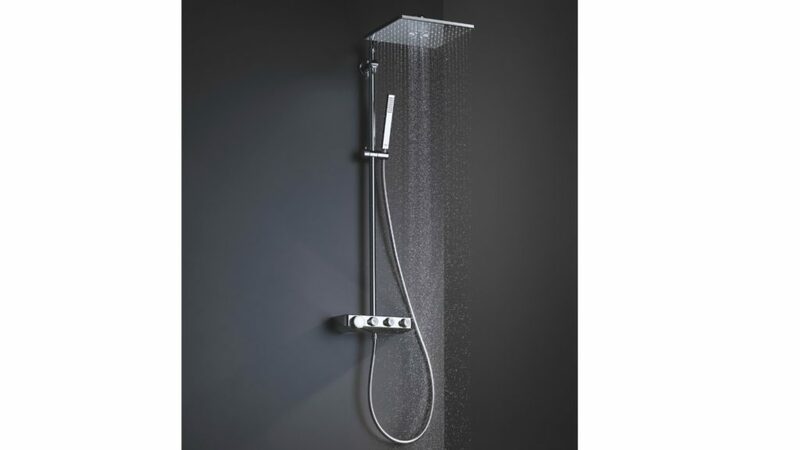 However, it should be pointed out, at the same time, manufacturers have worked hard to address creating a showering experience, without wasting water, such as the PowderRain spray from Hansgrohe which creates micro droplets for a drenching sensation and features in its Raindance models. Head of channel marketing for Hansgrohe Sarah Evans comments: “Customers are more in tune with the emotional side of their bathroom, so we’re seeing increased demand for innovative spray patterns, extra-large shower heads and intuitive water controls that deliver a superior experience. In terms of the look of the brassware aesthetics, although still very much in vogue, contemporary has now been joined by resurgence in classical design. 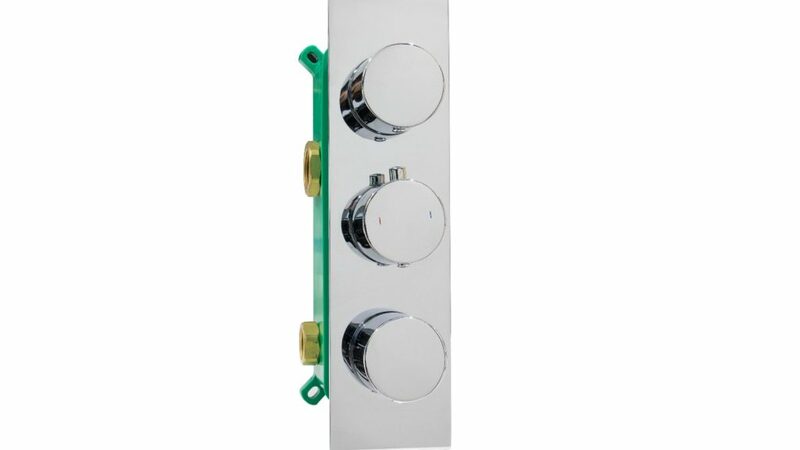 It is reflected in the choice of shower valves, with both exposed and concealed valves popular in sales. Paul Bailey of Grohe UK comments: “The trend for minimalism has sparked changes across all interior spaces in the bathroom; this has led to concealed showering valves becoming increasingly sought after. In fact, PJH has recently added the Sphere concealed thermostat to its Bathrooms to Love collection. 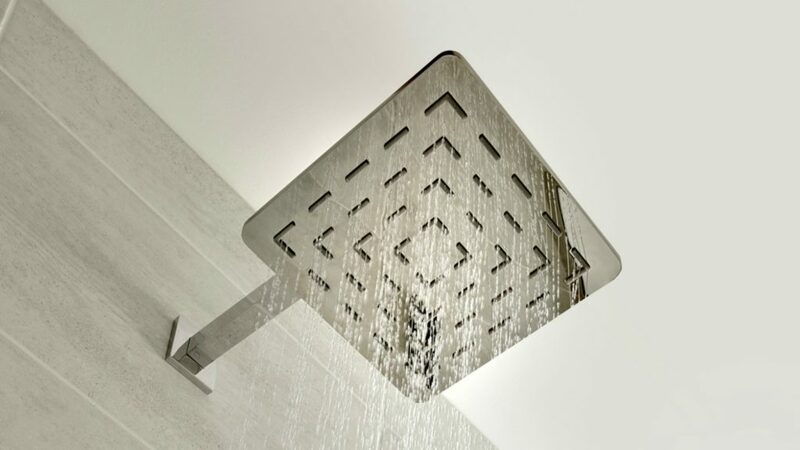 However, this is balanced by Barrie Cutchie of BC Designs who says exposed valve sales are taking off: “Traditional shower brassware will be huge over the next couple of years. And the finishing touches for valve, in terms of colours and textures, is offering consumers even more choice, from brushed through to polished and Nickel, through to Copper, Gold and Black. And senior category manager of Grohe UK Paul Bailey agrees: “Chrome still remains popular but consumers want additional colours and finishes that will allows them to put their own stamp of individuality on a space in a cost-effective way. “Brass and copper finishes, like Grohe’s Warm Sunset and Cool Sunrise finishes, have certainly led the way however Nickel and Graphite are also up-and-coming colours that cater for the darker end of the colour spectrum. While large scale showering environments, created through adding additional showering facilities or even removing the bath, can easily create a fashion-led style statement, the majority of installations are still over the bath. So can bathroom designers create a similar, personalised shower environment for consumers who may be more restricted for space? So instead of having to sharpen a pencil to take orders, accomplished designers will have a sharp selection of showers. And these will provide all the check points for consumers – classical and contemporary, in an array of colours, for walk-in enclosures and overbath installations. Read about all the trends for bathrooms in 2019.